US President unhappy with treatment of "one of our great companies". 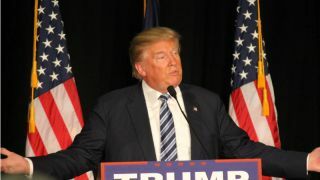 US president Donald Trump has spoken out slammed the EU's antitrust fine against Google. Earlier this week, Google was slapped with a record $5 billion fine for abusing the market dominance of its mobile operating system, Android. According to Reuters, Trump labelled the EU a “foe” when it comes to trade. According to EU Competition Commissioner Margrethe Vestager, the search giant broke EU antitrust laws by bundling its search engine and Google apps with Android, blocking device manufacturers from creating devices running forked versions of Android and by paying manufacturers and network operators to exclusively pre-install the Google Search app on their devices. Google's parent company Alphabet now has less than 90 days to alter its business practices or face penalties of up to five percent of its average global daily turnover. The company has said that it will appeal the decision though it could easily afford the fine since its cash reserves totalled almost $103bn at the end of March. Google’s CEO Sundar Pichai defended the company’s decision to include its own apps with Android devices.